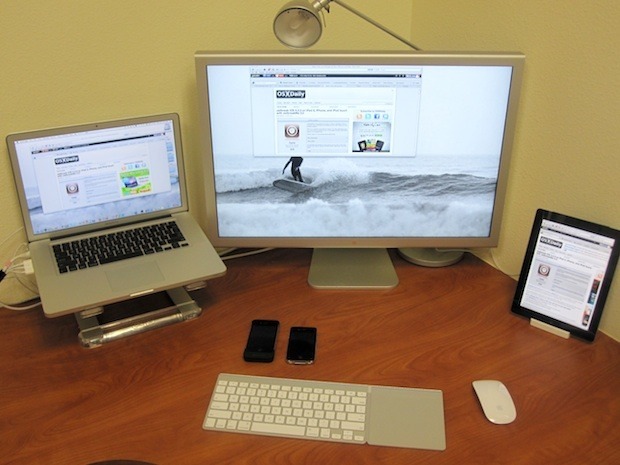 This Mac setup has all you need and is checking out none other than OSXDaily.com: a MacBook Pro 15″ with matte anti-glare display sits atop a Griffin Elevator Stand while connected to an Apple Cinema Display, an iPad sits to the right, and there are two iPhones rounding it out. This is a nice clean desk setup, and the Magic Trackpad and MagicMouse ensure the MacBook Pro is ready for Lion and the new multitouch gestures. Thanks for sending this in JW! How can I send in my set up for one of these articles? nice setup, just it would be difficult to find a wronger location for a lamp or probably not … moving it in front of an Apple Cinema Display would make it even worse. This looks just like my setup, similar desk plus I even have the same elevator stand. BTW the Griffin Stand is far superior to others because it keeps the bottom of your MacBook Pro exposed to the air and thus allows it to run cooler, my MacbookPro runs about 15° cooler with it on the stand when playing StarCraft 2 than when on a desk alone. I wish the Cinema Display was not $1000 because they are a beautiful match. Loving the Antiglare MacBook Pro. My next one will be just like it.